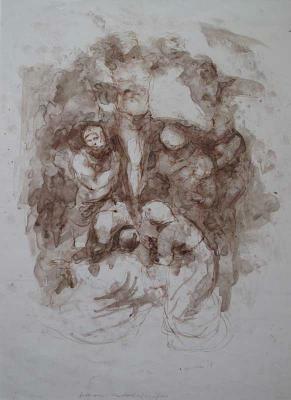 Turin Shroud and Crucifixion Scene, Double Image, ink and washes, By the Author. FLORIDA -- Yes. But it is not just any face. It is a face with contextual meaning. If God revealed himself in human history, then his face is connected with the particulars of that history. Christians believe that he was a Jewish man, a teacher, a prophet, and that he must have looked like his only human parent, a Jewish girl who lived in Nazareth. The origin from the chosen people waiting for the Messiah is a given. When his place in history began, his followers were Jews but they lived in the Greek Hellenistic milieu and the first representation of the savior, from the catacombs, is of a beardless man looking like Apollo, shown as the Good Shepard. Remember that Pope Benedict XVI has said that to understand the Early Church we must be aware of the "wisdom of Jerusalem" as well as the "wisdom of Athens". Pope Benedict has developed what I call a “Theology of the Face”, (not exactly analogous to Pope John Paul II’s Theology of the Body, a collection of thematically linked writings from many years), but a theme that Benedict has embraced and spoken about repeatedly, the face of God. He has also written eloquently and repeatedly about the importance of Sacred Art, Sacred Music, and reverent liturgy. This phrase has now become a part of the Mass, " into the light of Your face". The German journalist Paul Badde has written, “(Pope) Benedict explained that Dante's Divine Comedy had inspired him to write his first encyclical on love. (Deus Caritas Est) In the inner light of Dante's paradise, we do not encounter a still brighter light, but instead the gentle face of a human being: the face of Jesus Christ. The fact that God has a "human face" is the moving climax of Dante's journey from hell to paradise. 4. 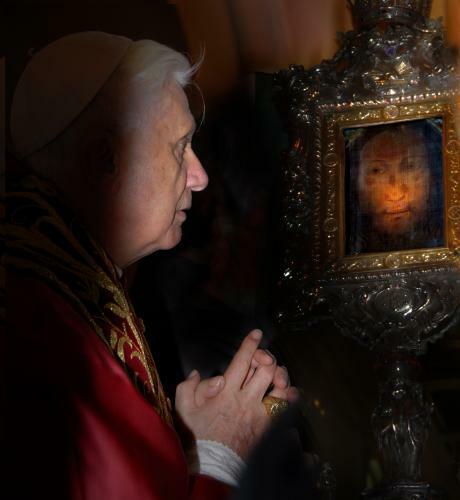 And Benedict has made pilgrimages to Turin to see the image of the man on the Shroud and in 2006 to Manoppello in the Abruzzi Mountains to see the “Holy Face” of Jesus on cloth. He said, “Should we not see in God’s hiding of himself the true catastrophe of the world, and therefore all the more loudly and urgently cry out to God that he show his face to us?” At World Youth Day in 2007 the headline was,“ Pope Urges Youth to Search for God’s Face”. He called his book Jesus of Nazareth his “Search for the Face of the Lord”. Benedict’s Theology of the Face is in tune with his idea that the revitalization of the Faith should be a personal relationship with Jesus Christ and not a philosophical system or an institutional advancement. It is not unrelated to John Paul’s Theology of the Body in that both have to do with the dignity of the human person, and that both are in opposition to the materialism of Enlightenment philosophy, and to the idea that truth is relative. Pope Blessed John Paul II has privileged representational figurative art in his "Letter to Artists of 1999".